It’s been an exciting few weeks at D&R HQ as we’ve been eagerly awaiting the delivery of our new range of taps, showers and door handles, and boy they haven’t disappointed! We’re over the moon to be adding these to our already fabulous range of beautiful things for the home. And true to form, these newbies are available in our carefully selected finishes, so if you’re an ABC (Anything But Chrome) kinda person you’re going to LOVE these! First up, our four amazing door handles: Hirst, Hockney, Lowry and Hepworth. Not only are they all beautiful, they’re all a classic example of perfect form and perfect function all rolled together into one delicious piece of hardware. These are available in black, graphite, luxe silver and rich gold, so if you can’t find anything that fits perfectly into your interior scheme I’ll seriously eat my hat. Second up, taps and showers. Yes you heard that right folks, taps and showers! To bring you more of the stuff you love we’ve expanded our range into kitchen taps, bathroom taps and showers. These are all available in two sublime finishes – satin gold and matt black, because quite frankly there really is no need for any other finish. Let’s start with the basics. It goes without saying that you’re going to need a bath, a sink (or a ‘marriage saving’ two sinks if you’re lucky enough to have the space) and a toilet. 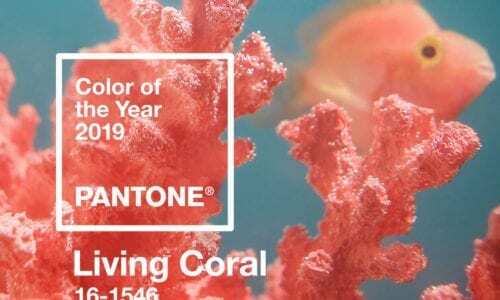 My advice would be to stick with white. 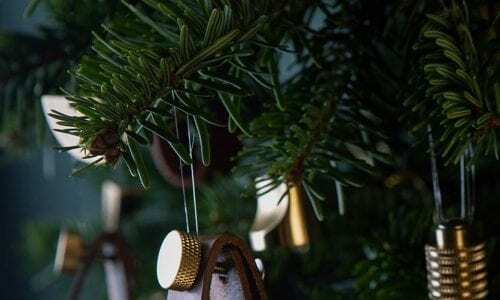 In terms of style, that’s up to you, but do think carefully about what would realistically fit in with the style of your house, and suit your taste of course. It’s worth noting here that if you’re struggling for space, a wall mounted sink and toilet is a good option. The more floor you can see, the bigger the room will appear. So onto taps and showers – hurrah! As I’ve already mentioned, they do come in a beautiful satin gold finish too, but let’s keep our eyes on the monochrome prize here and focus on the black. Small deck mounted taps like the Kagera, and Barkana are ideal for mounting directly on the sink or just behind a sink that sits flush with a counter top. Wall mounted taps like the Jadipai, Rosumo and Yuntai which work brilliantly in small spaces and create a boutique hotel feel. They do however require more work as all the plumbing needs to be concealed and then made good. Our two shower types are wall mounted like the Tinago, and concealed like the Havasu and Hannoki. Concealed showers are great if you’re doing a full bathroom refurb. If not, stick with the wall mounted. Whichever style of shower you go for, avoid shower curtains like the plague! I don’t think I have ever experienced a shower where the shower curtain hasn’t ended up sticking to my bottom. 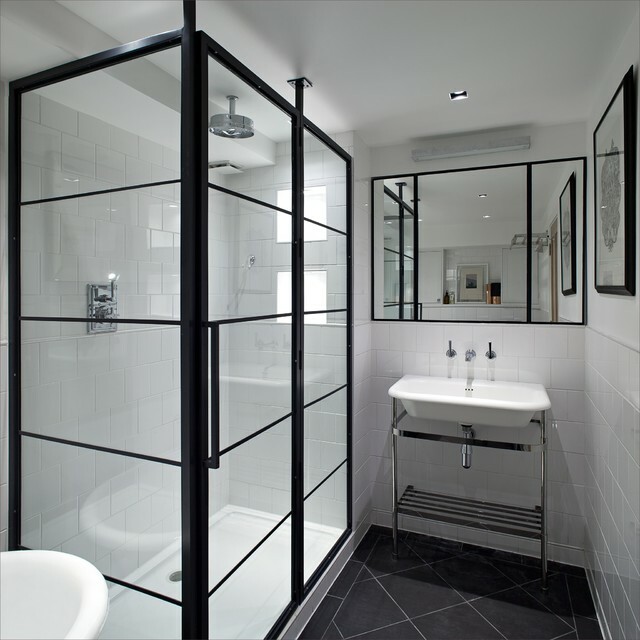 Instead, have a look at Crittal style shower screens which really are the showers screens of dreams. Next up, tiles. You can have some real fun here as there are some fantastic tiles on the market to suit all budgets. Go for a pattern if you want to make a statement, or stick with plain white for a simpler look. 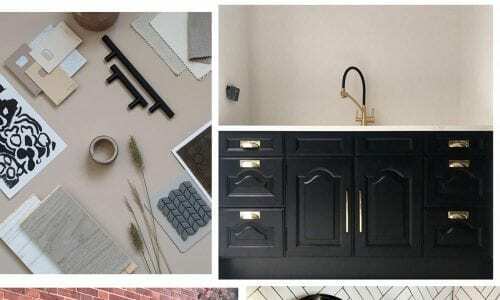 Do opt for black grout though. It not only looks fantastic, it’s brilliant at hiding that horrible pinky-brown grout slime. It’s an absolute winner for me. Let’s talk storage. Something that might not immediately spring to mind when planning a bathroom. But let’s get realistic, who can resist a BOGOF deal down the shampoo and shower gel aisle at their local supermarket? Add that haul to your stash of towels and you’ve got yourself a storage conundrum. For the bathroom-y stuff you don’t want on show, make room for cupboards – wall mounted or floor standing, depending on how much space you’ve got. 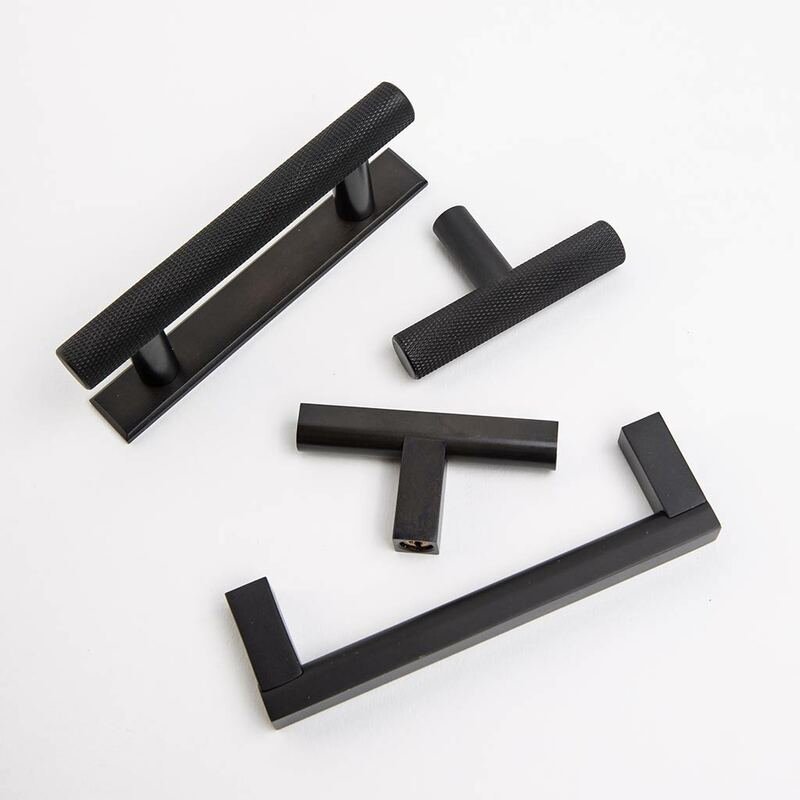 To co-ordinate with your super-duper black tap and shower, top off your cupboards with some stylish black handles. We’ve got an amazing range but I’m going to cherry pick the following suggestions: the black Taipei handle, its dinkier sibling the black Taipei T-Bar and the black Skyscraper with Plate, which is superb if you’re replacing handles on existing cupboards as the plate covers the old holes – genius! And as for the stuff you would like on show in your bathroom, invest in some shelves. 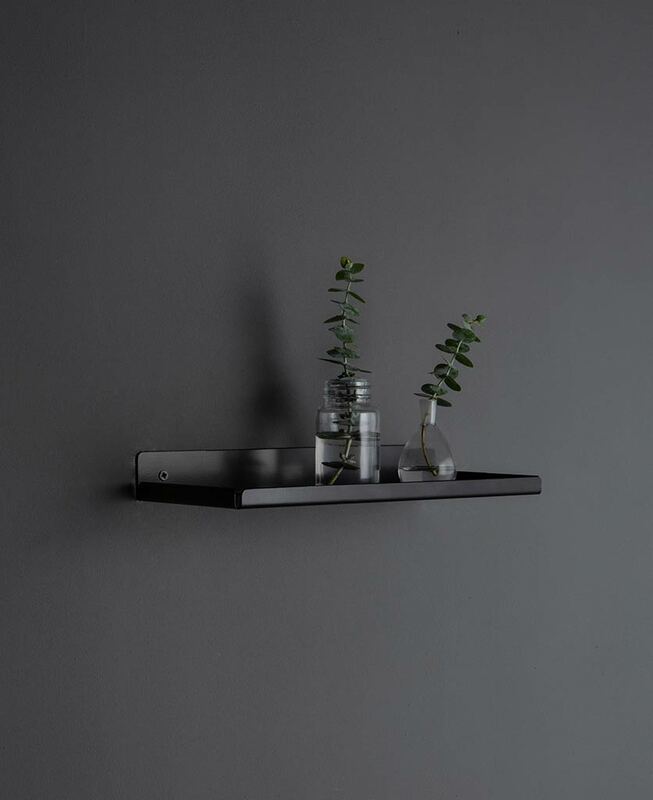 To further bolster your monochrome scheme, let me introduce you to the Assam shelf; a slimline metal shelf that’s perfect for a plant or a couple of trinkets. And lastly on storage, let’s not forget the humble hook. The black Bauhaus hook is great for a bathroom as its hexagonal shape means your stuff really stays put – perfect for hanging your towels on. Next up, paint. Undoubtedly one of the easiest ways to transform a room quickly. I can wholly recommend painting the ceiling black, yes really! It works so well in a monochrome bathroom scheme. 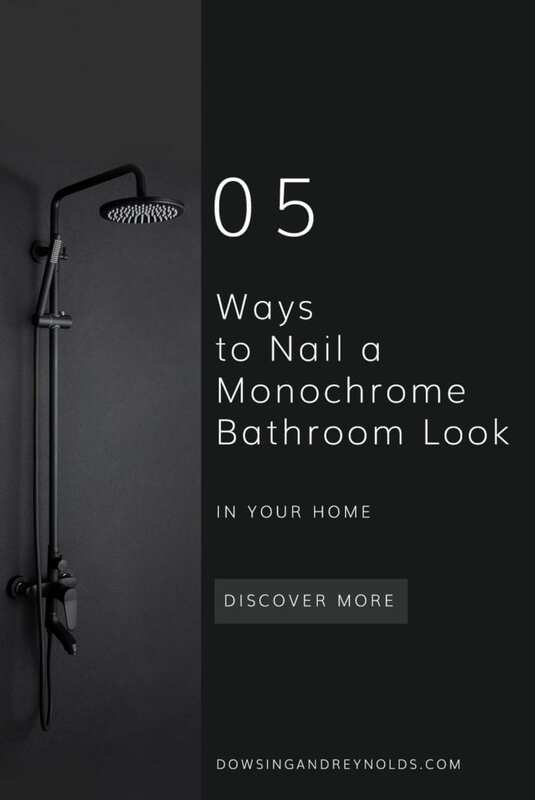 Check out our All The Lights Off paint which is a decadent shade of black – not a harsh pure black, but a softer hue which will give your bathroom some real oomph. So let’s move onto shaver sockets. Admittedly it’s not the most exciting of topics, but it’s these little details that will set your bathroom apart. Say goodbye to ugle white plastic shaver sockets and hello to our gorgeous black shaver socket. A perfect addition to your monochrome scheme. The great thing about a monochrome scheme is that it provides a basis from which you can add many colours. As and when you fancy. Simply replace towels and nik naks. My favourite colours that really complement black and white are grassy green, teal, dusky pink and bright yellow. Just don’t do them all at the same time! So as we come to the end of this blog post, we’re going full circle back to the beginning with door handles. 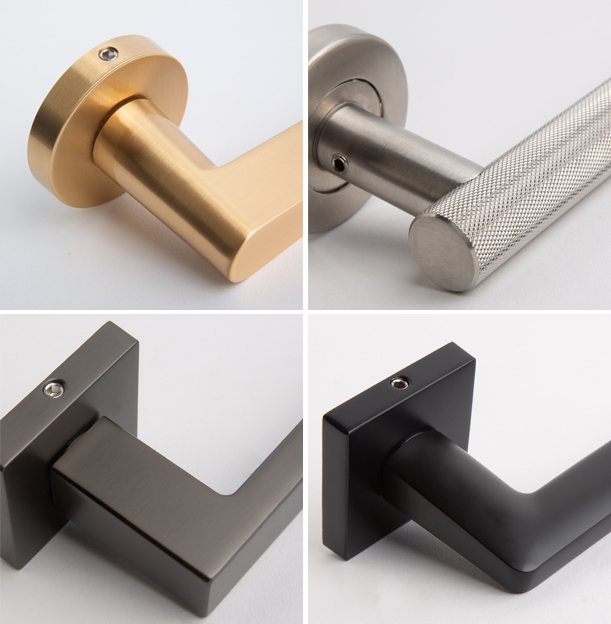 Make sure you set the monochrome scene as you approach the bathroom and treat your door to one of our door handles. Don’t ask me to choose a style, it’s like asking me which of my children I love the most!